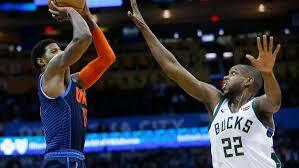 OKLAHOMA CITY (AP) – Paul George had 36 points and 13 rebounds, and the Oklahoma City Thunder beat the Milwaukee Bucks 118-112 for their fifth straight win. Russell Westbrook had 13 points, 13 rebounds and 11 assists for his 16th triple-double of the season and 120th of his career. Jerami Grant scored 16 points for the Thunder, who knocked off the team with the NBA’s best record.